Editor’s note: Atherton resident Gillian Bostock is not only a talented, serious-amateur chef, she’s also an accomplished photographer. This is the third in her series of great summer recipes. In my family, it’s become a tradition to make Sunday night “pasta night” and, in the summer especially, we often have homemade pesto along with traditional marinara sauce. Homemade pesto is surprisingly easy to make and almost surely better than any store-bought pesto you can buy — no matter how much you pay for it. Secondly, your olive oil should be good enough that you are able to recognize its various notes when you have a spoonful of it on its own. I sometimes add in a bit of my most flavorful “dipping” olive oil, but I find it unnecessary to use the recipe’s entire one-cup with often-pricey, top-quality olive oil. Lastly, the Parmesan really should be none other than Parmigiano-Reggiano as indicated by the writing on its rind. Light in color and eager to crumble, this delicious cheese should be grated shortly before incorporation so as not to lose any of its flavor. 1. Pick the basil leaves off the stem and run water lightly over them to rinse. Spin in a salad spinner and then lay out on a paper towel to dry. 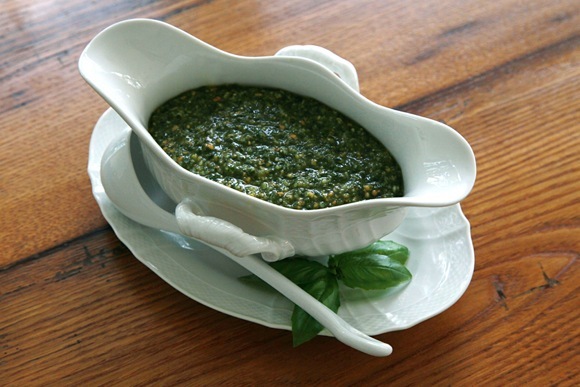 The leaves must be as dry as possible before using so as not to add any additional moisture to the pesto. 2. Preheat oven to 350ºF. Lay pine nuts out on a baking sheet so they are spread out in a single layer. 3. Bake pine nuts for just a few minutes until golden and their scent fills the kitchen. Keep a careful eye on them because they will be done before you know it! 4. In a large food processor, put in the basil leaves. With the settings on low, add the olive oil in a constant drizzle. 5. Add the pine nuts and minced garlic cloves. Process until mixed. 6. Add the Parmesan. Process until the ingredients are incorporated but do not “disappear.” You should, for example, still see bits of chopped pine nuts (see photo of finished pesto). 7. Taste and add sea salt if necessary.